Oddly enough, as much as I enjoy cooking, when it comes to baking I am very sporadic. I have to really *plan* ahead when I want to bake something, and I often get impatient halfway through – which will have an end result of something going a little wrong with what I’m making. I know darn well that baking=chemistry, and when following a bakery recipe you don’t stray from the measurements or else whatever you’re making will end up somewhere along the lines of dry or crunchy, under or overcooked, or too flat. I think it’s safe to say that I did okay with these! 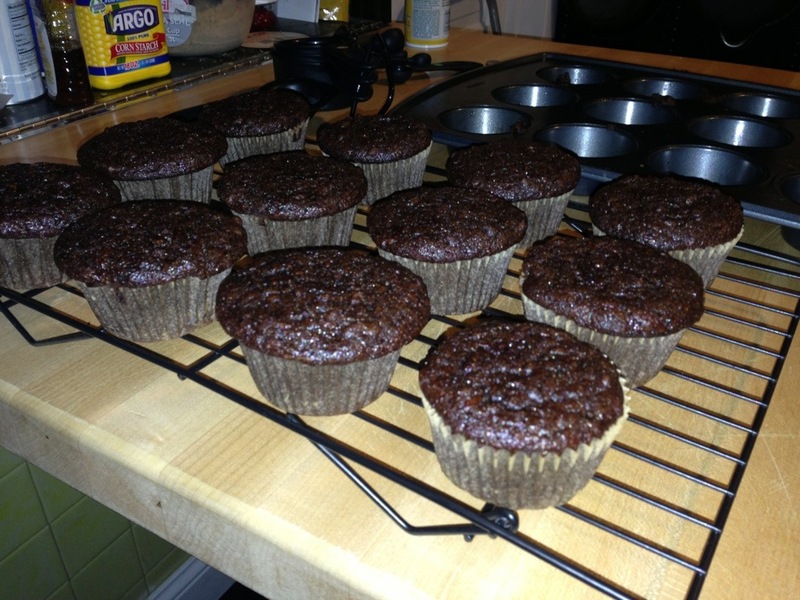 Even though they are double chocolate, they are muffins (though my husband said they were more like cupcakes) and I admit that I did eat them over the course of the week for breakfast. I do love me some chocolate for breakfast (as anyone from high school and/or college can tell you…and my husband for that matter). A great chocolate fix, and there’s vegetables it! Woohoo! Preheat the oven to 350*. Take your muffin tin and a) line it with with paper liners (like I did) or b) spray it with cooking spray. Mix the flour, cocoa powder, baking soda, baking powder, salt, and cinnamon together in a bowl until well-blended. Add the chocolate chips and mix in. In a seperate bowl, whisk the eggs, oil, sugars, and vanilla together until they’re well-combined. Add the zucchini and mix. Slowly add the flour mixture to the sugar mixture until just combined. Spoon or pour (depending on your bowl) evenly into the muffin tin. Bake in the preheated oven for 20-25 minutes or until a toothpick inserted into the center comes out clean. Once you remove the tin from the oven, let it cool for a few minutes before removing the muffins & letting them cool some more. Yet again, this is another one of those recipes that I saw on a blog & couldn’t quite get out of my head. I’m not sure if it was because of the usage of zucchini, the double-chocolate-ness, or both. But I have to vouch that they are easy, delicious, and definitely worth making again – if any of you have some large zucchini that you need want to get rid of, make these. In addition to the chocolate, I loved the fact that these muffins were very moist (as much as I hate that word but whatever). They didn’t dry out and honestly, I couldn’t see nor taste the zucchini in them – which can be either a good or a bad thing. They were, however, also very easy to make and as I said before, a great way to use up some zucchini that’s been there a while in the fridge (like mine was). These were a fun and delicious kick-off to my first week of school and if you decide to make them, I’m sure you’ll enjoy them as much as I did.